Work with frottage, a technique in which a rubbing is taken of a surface creating a textured effect to make a collection of papers to use in design work. Develop design inspiration using mark making, layered papers and colour washes to create expressive interpretations of reflections on a variety of background surfaces. Explore the subtle colour combinations and textures found in reflections using a limited palette of acrylic paint, adding depth and contrast with layers and further collage. 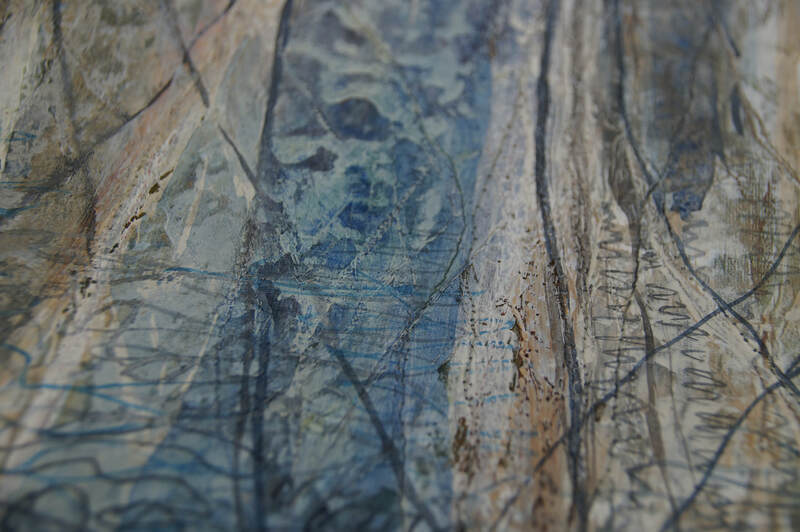 The surfaces can be developed and incorporated into your own working practice in mixed media and stitch. This workshop is suitable for those with a little experience through to advanced. Materials are not included in your course fee. Some materials will be provided by the tutor. The approximate cost of these will be £4, payable to the tutor during the course. A selection of brushes for use with acrylic paint, include a number 10 or 12 round brush if you have one. A sketchbook pen and pencil for notes and compositional development. Apron or overall, please wear suitable clothing.